This 3-in-1 stroller solution offers a versatile design that grows with your child. Infant mode offers both Car Seat Carrier and Carriage function. As your child grows the Pivot�s usefulness evolves to accommodate both forward � and rear-facing seated positioning. Fit: Top of child�s head is at least 1 in. below the top of the child restraint seat back. Within 6 months the wheels have gone to junk. It doesn't ride straight anymore and I would say I've used it as much as assumed for 6 months (nothing too crazy). I don't recommend the stroller at all, and it's sad to say because I was originally in love with it! I ordered this stroller for it's nice chic look but it's completely garbage!! First - to connect the infant car seat to the stroller is difficult!!! 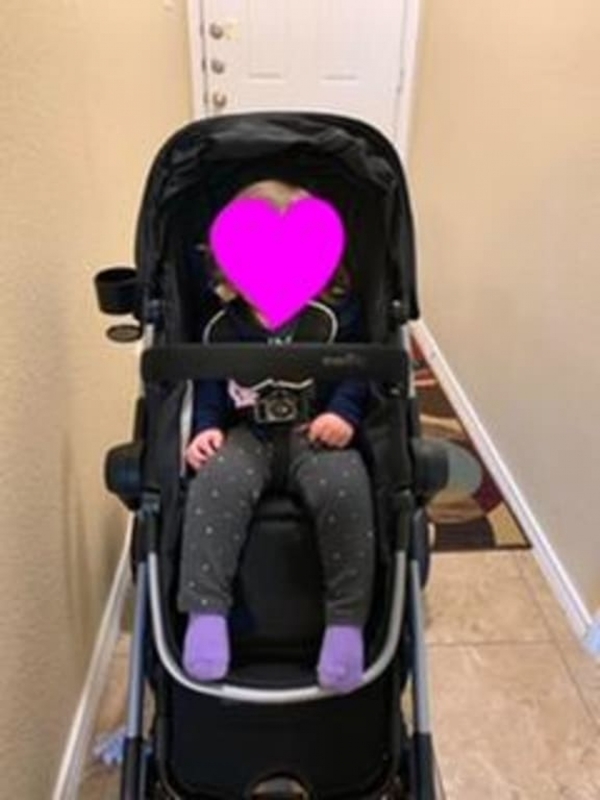 I use to have a Graco click connect and it was a breeze but this stroller is difficult to connect to!!! It takes me from 5-15 minutes trying to attach the freaking car seat to the stroller!!! THIS IS NOT CONVENIENT AT ALL!!! I have a growing infant and to loosen the straps is another mission!!!! This stroller is poorly made! It's not worth the $$!!! I have this stroller for my daughter and I Absolutely LOVE it! And I love how I don't have to use a changing table if I'm out I can just change her in the stroller! I just bought this same stroller for my friend and she LOVES it as well! It was very easy to assemble! I love the options for different positions on this stroller. When we are using this with just our toddler - its terrific to be able to adjust her to different heights and positions. She seems very comfortbale and happy with it. Daughter Now Prefers This Over Seat! My wife and I are very glad with this product. We bought it when our 2nd son was almost born. This product is very easy to assemble, and easy to change seat positions. We live in an apartment and use elevators regularly; the dimension of this product (length and width) is elevator-friendly compared to other types that are either too long or too wide to fit the doors. We appreciate the idea of adjustable seat height position - my older son loves it when he sits alone in higher position; it gives him better view and excitement. Received my order and put it all together, unit looks great and rides smooth in the house. May take my Toddler in it just to see how it rides. Baby not due until July. I love how versatile this stroller is. the features are nice. It's compact enough to fit in my car and I love the basket space. The price is reasonable compared to other strollers. This system is seriously amazing! I love how cushioned the car seat is, so its comfortable for my baby. The stroller wheels are nice and sturdy and a little bulks so I'm able to ride over bumps and grass etc. i love how the net at the bottle is made easy for me to put things. And the toddler connected piece is greatly made. I would recommend this system to everyone. Compared to my other 2 child stroller, this one is more compact and easy to set up and fold up. The new design is stylish to boot. Also found this stroller pretty easy to maneuver while shopping. 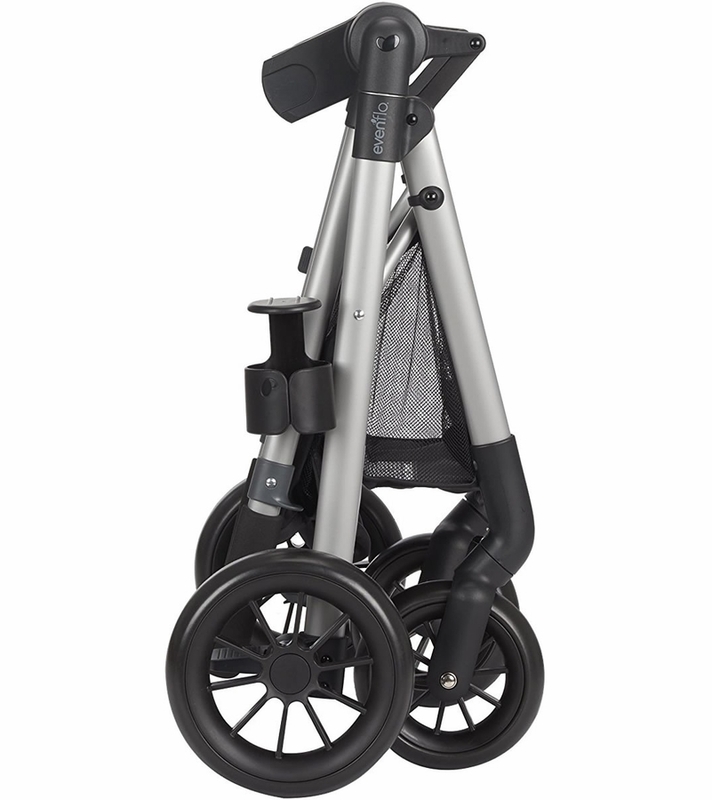 It is pricier than my original stroller, but it looks nice, has better wheels, and is easier to use overall. Just going to be straight forward, loved everything about the travel system. It's just perfect. What I love most about this stroller is the number of seating options available (toddler seat plus infant car seat, 2 infant car seats, or just one seat). The large storage compartment kept everything contained and easily accessible. The only negatives to be aware of is the absence of cup holder for the child, and it was a little difficult to open from the closed position. I like all the features of this stroller. The frame is nice and strong but it makes it heavy to move when collapsed. It pushes very nice with the large wheels and handles well. I wish is came with the car seat and base instead of just the toddler seat. The frame latch is very secure when folded but also tough to open. This is a nice, sturdy stroller I've been using with my large toddler. The features I like are the adjustable parent handlebar, good drink holder, easy-tilt chair for naps, sun shade, and very large basket for holding groceries and stuff. I also like the way the foot break works. Also, it was very easy to put together. The downsides, at least for me in the city, are that it doesn't fold up as compactly as my Citimini and that it is pretty wide. It is also not very light. Basically, it is a full-size stroller and has the pros and cons that come with that. For me this will be my weekend stroller to facilitate carrying stuff and napping around the neighborhood, but I will use my umbrella stroller for quick walks to daycare, travel and the subway. The one other thing is that I think before long my tall 2.5 year old will be too tall for this stroller. Plenty of smart practical features! I have an older model of a 3 wheel EvenFlo stroller, however I was interested in a double stroller that wasn't too bulky & I came across this new stroller! This stroller offers plenty of new features & is able to carry a infant car seat w/ a toddler seat below. It's less bulky than a double wide stroller and is very modern looking as well. I'm very excited to use this for the upcoming summer & whenever we plan on having a second baby. Thank you EvenFlo! We got this stroller just in time for our family vacation. We love how small the stroller can fold down and that it's very light weight making it great for travel - especially on an airplane! Our daughter seems to like this stroller best in comparison to our other strollers as she is able to sit straight up and higher making it easier for her to see everyone and everything around her. The stroller is very easy to push and maneuver. 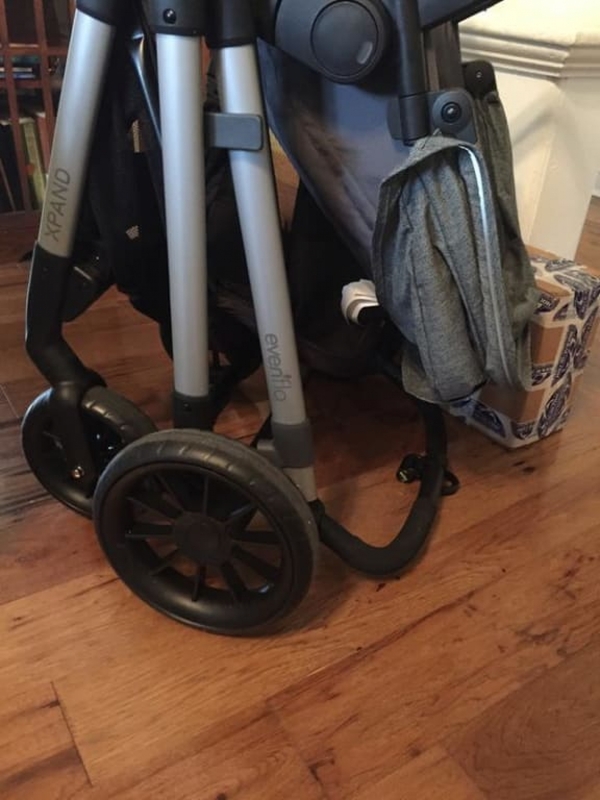 Our only complaint is that there is nowhere to put any of your belongings (ie: phone, keys, etc) but this is easily fixed with a stroller caddy. The canopy extends quite far blocking a lot of sun when needed! 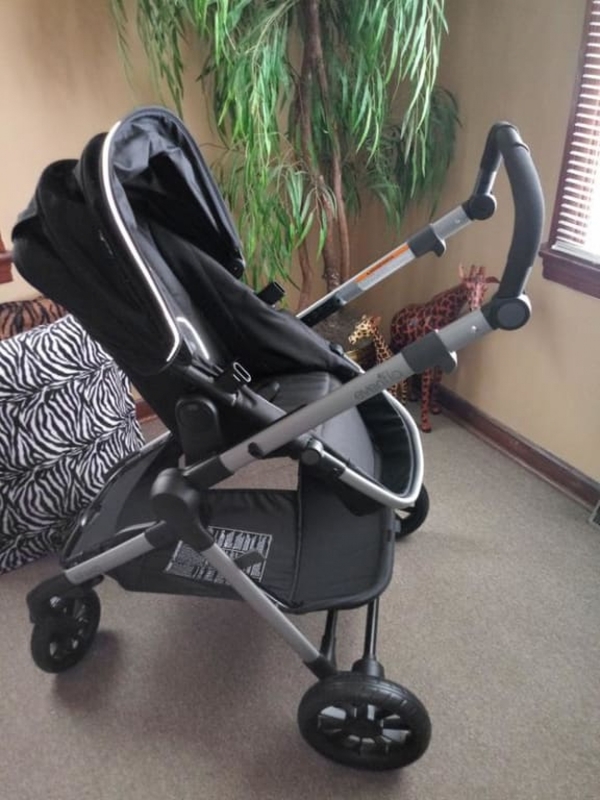 Overall, we love this stroller and would definitely recommend! LOVE the look of this stroller. It looks and is very good quality. Also has a very smooth ride, as I had my 8 month old in there to test it out she got so comfortable she started falling asleep within a few minutes which counts as a win in my book. The only part that could be a concern for some which is why I gave 4 stars, it is very heavy and not the most compact. It is a little difficult getting it into and out of my SUV but it does fold flat even with the toddler seat attached which is great. Personally I care more about the quality and how smooth the ride is so I make sure my daughter is comfortable so the weight isnt a huge concern for me when considering my needs. I don't have two children yet so I am unable to comment on the extended mode but from what I can see it will be a great option to have when it does come to that time. Upon receiving the Evenflo Pivot Xpandâ¢ Modular Stroller (Stallion), I took the time to get everything out and ready to assemble. Putting the stroller together was surprisingly easier than I expected it to be. The instructions were very thorough and made the process simple . I didn't have a chance to use the stroller for an infant but I used it with my toddler and she absolutely loved it and so did I! The adjustable handle makes it easy to find what's comfortable for you. The large cruiser wheels make the ride smooth and able to deal with several different terrains. There are quite a few different ways to have the toddler seat positioned, which was so unlike any stroller I've ever had before. The extra large storage space underneath is an absolute blessing and totally necessary as any parent knows. The self sustaining, compact fold made for a trouble free storage. One of my favorite things was the 5 point harness for the toddler seat. It was effortlessly adjustable to fit your child as you need. I will recommend this stroller to everyone and anyone that will listen. Best value for your money by far! This stroller is awesome! First off, I just love the way it looks. It is also so easy to put together and fold up. My favorite part is how the part where the baby goes can fold so he can lay down and the basket underneath can fit so much. Also moves smoothly with my son in it. I love it. What a great stroller! I love the variety of positions and options this stroller offers. It's a great stroller to have from the very beginning. I love that it's compatible with several infant seats and can click right in to the frame. The stroller can be configured in so many different ways. The options are endless!! On top of having multiple options for seating, the storage basket underneath is easily accessible and rather large. 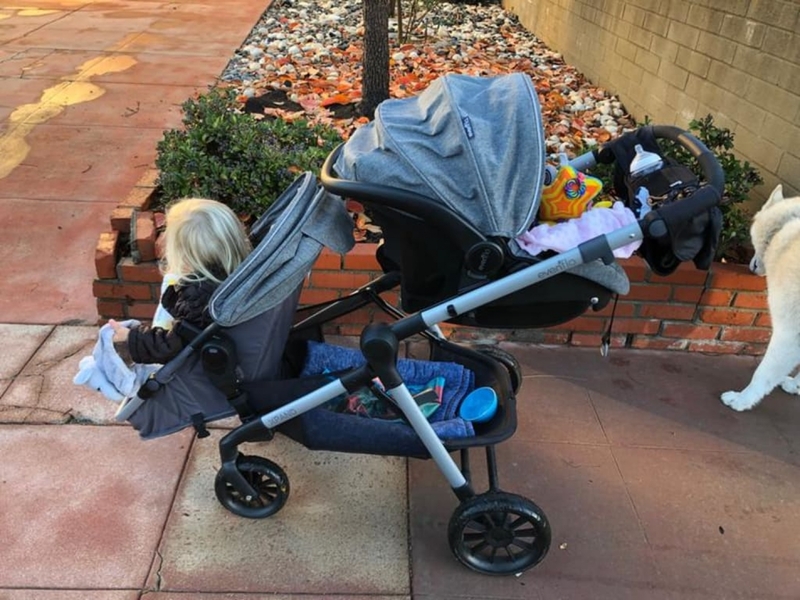 Only negative would that it's not as simple as other strollers to collapse and store and there is no place for the adults items at the top/handle of the stroller. The color is wonderful because it won't show dirt with daily use. The adjustable handle is a must have. The stroller arrived about a week ahead of schedule. It was packaged very well. Assembly was a breeze all parts were easily assembled. I love how I only need one pedal to stabilize the stroller. My grandson is three months and when shopping it's very convenient to use the bassinet mode he sleeps well while I shop. The basket holds all the new items I'm purchasing for my little. Folding the stroler is a breeze. Cup holder is handy for my cappuccino while shopping. My grandson sleeps well even if we hit a bump in the sidewalk. Since heisso young I've only used the parent facing positions because I need to see him at all times. The stroller look so nice I have received many compliments while shopping. Stroller fits well in the back of my Kia Sorento with room for other bags or groceries. All in all it's a great stroller. Button mechanisms are easy to use. The only problem is when I remove the seat one side will stick if I don't pull up on both sides evenly, but that's my fault I have learned how to use the stroller after several days of use. This stroller was a big hit with myself and my Husband due to the numerous configurations and ease of use. It is a bedti attractive, sleek stroller perfect for zipping around the city and stores alike. We love the large easily accessible cargo basket, the super easy foot pedal lock/unlock feature and the reclining seat. I must say I truly miss having the parent tray, as well as the snack tray for the kiddos, as I used both quite often on our old Evenflo stroller and the single cup holder just doesn't cut it. It is quite easy to fold, but is a bit heavier than I'd like, though definitely nothing I can't handle. 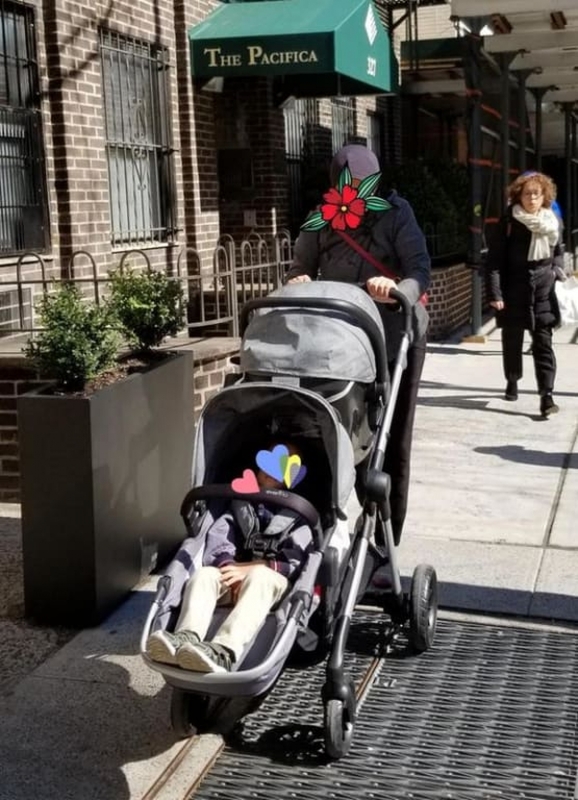 One complaint we did have was that it is quite difficult (due to design) when it comes to tilting the stroller back to get over curbs, etc. Otherwise we love the versatility, maneuverability and our daughter seems to enjoy riding comfortably in it while holding the bar or laying back taking in the scenery. It was also very easy to assemble and reconfigure which is which is a huge bonus. All in all a great product, minus a few key features. Thank you Evenflo! I love this stroller. The fact that I can change it from forward facing to rear facing and have my baby sitting up or laying back is great. J also love how the seat can be placed in other positions so it can become a stroller, plus how you can pull the seat off and carry it around. The only thing that I would improve is the tires. They could be a little bigger for more shock absorbency. Easy to put together, or maybe it looked easy since my husband did it all haha. Baby was super comfortable when we put him in. Love the way it looks, it's stylish and practical. We love the option to make it a double if in the future we choose to add to our family. So happy with this product, and all other Evenflo products we own. Love love love. There are many ways to set the seats up. Large storage underneath is great and the handle is adjustable. It's well made, sturdyand feels like it should cost more. Four different ways to set up the stroller. Great for newborns to toddlers. This will last a long time and get a lot of good use. Great option for 1 or 2 babies! I've had the Pivot Xpand for a few weeks. It is a pretty great stroller. It comes almost completely assembled; simply pop the wheels and cup holder on and you are done. I've taken it shopping and on walks through the neighborhood. It doesn't have noisy wheels or anything and pushes smoothly. It is easy to turn in every position we had the seat. The stroller frame flexes a little in turns but it doesn't seem to be a quality issue at all. The seat is beyond is to remove and replace in different positions. I love that it can be parent or forward facing. My daughter is 31" tall and 24 pounds and the seat didn't seem like it would accommodate much more width. It comes with a belly bar which is awesome but I would have liked to seen a sippy cup/snack holder with it at the least. The canopy is nice and dark and has an awesome mesh peekaboo window. I wish it was a little larger. The handlebar adjusts to fit a large range of heights, I'm only 5'1" and pushed it fine. My friend is 5'10" and found it comfortable as well. It is a two-handed folding stroller but folding it is pretty easy. You need the seat facing out for the best fold. It is self-standing as well, a huge plus. This stroller does not have a compact fold, though. I don't think its overly large for the type of stroller it is but it took up a good portion of the cargo area on a Rav4. I didn't try this with both seats but I imagine with the numerous combinations of seating positions that it would work perfectly with both. The basket underneath is large and easy to get into, especially with just one seat as I use it. The seat adjusts to three positions and is the easiest adjusting seat ever! I wish I could give it 4.5 stars because it really comes closer to 5 than 4. I was so excited about this stroller. I did a lot of research and put this on my registry. The car seat was supposed to last through my child's infant phase and and it lasted maybe three months because my baby no longer fits in it. He is tight and uncomfortable. I tried loosening the straps but the car seat is entirely too narrow. Also it has been an absolute nightmare trying to attach the car seat to the stroller. It takes me several tries to attach and I have just given up. It's very difficult for a mom on her own/ recovering to work this product. I have spent more money trying to replace this product (because buy buy baby won't take it back now) that I wish I knew then what I know now. My fianc�© and I purchased this travel system for our son when he was 3 weeks old and we instantly fell in love with it! He is now almost 4 months old and every time we use it we always say "this is the best purchase we ever made". The stroller is very lightweight and moves effortlessly! The bottom basket is big, and the car seat clicks into the stroller easily. We love that we have the option to use the car seat or the bassinet with the stroller! I love all the various seating options this stroller has to offer. I like that with just s few twists and clicks you have a double stroller without the bulkiness of having a double stroller. I also like how you can adjust the seat up and down to not only allow for another child but to fit bigger items in the basket that usually wouldn't fit. Another thing that I really like is that the two tiny little tabs that used to control the brakes have been replaced. The new braking system is enclosed and controlled with one much bigger tab that is much more sandal friendly. A few things that I didn't care for was the bar going across the front of the stroller. When taking toddlers out I found that the bar being there, made it more difficult to take them in and out especially in them moments where they didn't want to go in. In addition the rest of the stroller folds up to be rather small except you got this big bar that sticks out. It would be nice to have some covers to put over the slots that holds the bar in the event we're choose not to use it. Another thing I didn't care for was the location of the cup holder. It never fails to be going down a tight area in a store and that is the first thing that gets hit. Which leads to the last thing I didn't care for which is there is no place to put your small items such as kids toys or cell phone. Maybe some sort or adjustable mesh bag would be nice. Either way these things can be over looked or added through a separate purchase if really a big deal. -With two kids you're going to need a bigger basket for storage. The storage basket for the Pivot Xpand is easy to take items in and out of and large enough to hold all my baby essentials. -Finally! A stroller that has mastered a cup holder that won't splash on me or the baby!! -Without kids the stroller is lightweight and easy to fold. -Stroller seat (not infant) is easy to buckle in your little one, nice recline, great sun shade, and an adjustable foot rest. 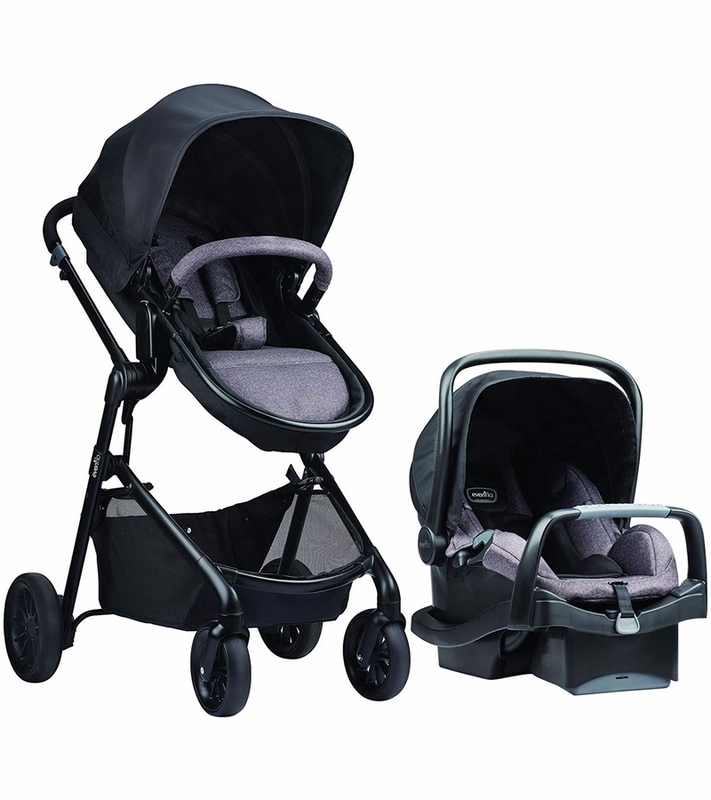 -infant car seat has nice shade, handle and click travel system is convenient. -The infant car seat is a bit narrow and my six month old is cramped in her shoulders. -A few times I hit a crack or dip on the sidewalk and it rattles so hard that my infant startles. Perhaps needs better shock absorption to make it a smoother ride. -my husband and I are tall and would be nice to have adjustable handle bar that raises higher. -very heavy to turn with both my kids in it. I received this car seat when my daughter was a newborn, and I love it. My family and I have been so happy with it because it is very easy to install and move from carseat base to the accompanying stroller. When caring for a newborn it is so nice to be able to easily click the car seat onto its base and then onto the stroller when I'm running errands. Outside of the safety features it is a very nice looking car seat, I have been stopped by other moms and asked about the car seat, everyone loves the sleek design! I highly recommend this car seat! This stroller is great! Super lightweight and easy to move. I bought it to use with three kids - two babies and a toddler - by adding a second seat and a kick board. It's awesome! My only wish is that the sun cover was larger, since if you tip the kids back in the stroller at all it isn't long enough to keep the sun out of their eyes. The coffee cup holder is a nice feature, but it feels a little strange in its placement on the handle bar. Other than that, the stroller looks great, works well, and is super easy to use. I'm very happy! By far the nicest stroller we have ever had. Husband said it was easy to assemble- never even looked at the directions. It is exceedingly stable. We walk a lot on uneven and unlevel pavement. This stroller never felt like it would tip. The basket is pretty large. A little too open (I'm afraid it'll get a lot of gravel and dirt from walking). The wheels are actual tires. My youngest saw it and proclaimed' "mine." He's very happy to rise in it. All in all we are very impressed. My wife and I call it the Cadillac of all strollers. Very easy to assemble, took us about 5 minutes. Absolutely love the size, perfect fit for my Kia rondo. Stroller folds so easily and I love how I only need to put one pedal to stop it from moving, I also love the cup holder that's on the side. My toddler is almost two and she fit perfectly in it, if she falls asleep I can just put it in the bassinet mode. This stroller has many many positions to choose from and it's so light weight. 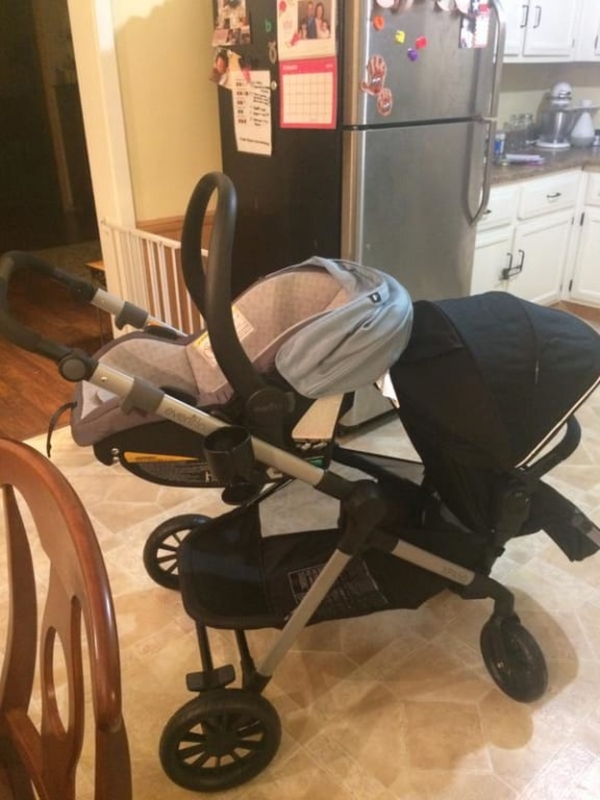 stroller looks bulky but itd light! My favorite part is that when we have another child I can just use this as a double stroller without having to invest in another stroller. Cons: Button mechanisms are very hard and get stuck; the levers to close the stroller are not easy to pull up on. I had a really hard time with this, maybe because the stroller is new? not sure. Same issue with the button to expand the stroller for second seat, you really have to put muscle into it to depress the button all the way down. Same with the buttons in the seat to remove the seat from the stroller. Not user friendly at all. The parent cupholder is not very sturdy, my 14 month old is able to remove it easily. Overall I give this stroller 3/5. It is priced fairly for the quality of product you get. I was hoping to love this stroller but its very frustrating that all the buttons are so difficult and get stuck. It is an easy push though and good option for family's with multiple caregivers. Very Sturdy, Yet Light Weight. This is the second stroller I've used and compared to the first, which was great, this one is much better. It's easy to get my kids into, its very sturdy, and it handles rough terrain very well. I love that it has an option to make it a 2 seater but I don't love how you have to buy an extra part to enable this feature. Over all its an awesome, sturdy stroller! The assembly was easy, most of it comes put together, you just need to slide the wheels on. I think it took me under 20mins, and most of it was because I had a hard time figuring out where the "unlatch" clip was. We got this stroller because we are expecting our second child and wanted something for 2 kids that was not a side by side and could still fit in the trunk. I let my 2yo son climb in and he didnt want to get out. We moved him around, laid him back and put him in all the positions. It comes with the toddler seat, so we will need to get the infant car seat. Although the toddler seat is suitable for infants, it is not a car seat. So a transfer will be needed from car seat to bassinet if you want to go for a stroll with the baby in a mall or park. It does not fold up as small as our other stroller, but it is close. I would not recommend this stroller for air travel. The wheels are wider in the back and when folded up it seems like it would be too easy for luggage handlers to break. Pros: Color is nice. Seat seems comfy. Many positions. Cons: Possible durability. Sizing. (My 2yo is already 36in tall, and 38 is the max. His head already hits to the top of the seat.) Width of back wheels. This stroller is amazing!!! Super easy to assemble. It's a very smooth ride, and easily turns corners. My child loves being able to face forward or towards me. 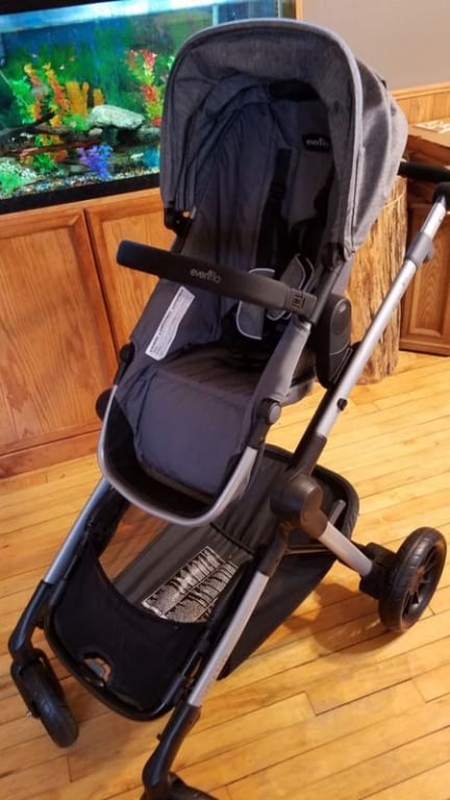 Evenflo Pivot Expand stroller review. I'm expecting my 2nd child the beginning of the new year. Over the summer I obsessively researched single to double strollers and was quickly bummed when I realized how expensive they were. My hope was to upgrade from our current single stroller to a single to double so that it will last years to come in use. 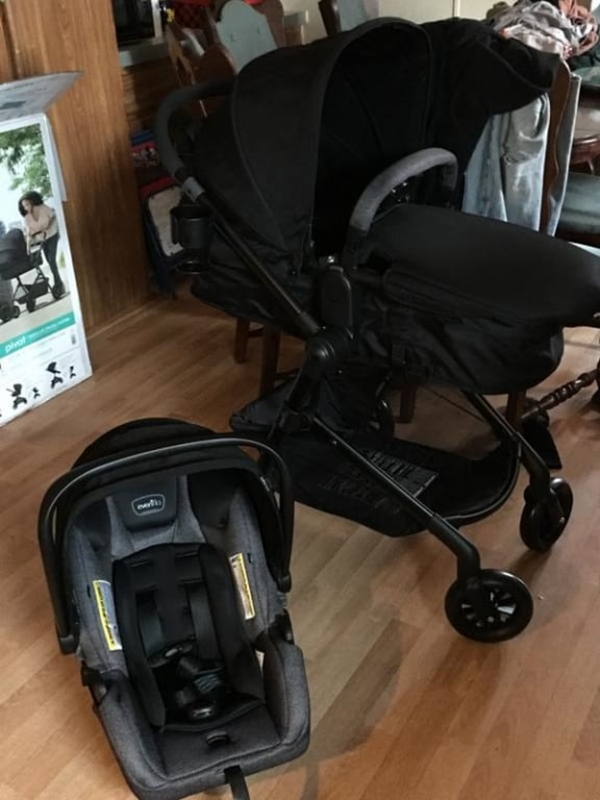 As I was searching I came across Evenflo's recent release of this stroller and after watching others reviews and comparing it to similar strollers I was certain I wanted it! It was unbeatable in price and so convenient with all it came with. Recently I was given this stroller and let me just say I am over the moon happy and grateful to of received it! It's exactly what I was hoping for. That being said their are a few things about the stroller I wished were different or will just take some getting use to. -It's not a one handed folding system. -The security latch that helps it stay folded when folded is a little hard to release. -There is not tray or pockets for your kid to put snacks or their drink in. It's just a seat with a bumper bar. -There's no parent tray to put keys or phone in. There is a single cup holder that comes with it but if your not careful it comes off easy when folding the stroller up. -The back wheels are on the wider side so you need to be careful going through tight places in a store. -A little heavier then expected to lift when folded (and toddler seat is still attached) into my car. -The handle gets dirty easily because it's used to help stand up the stroller when folded. -Its so sleek and glides very smoothly on most terrain. -My 2 year old loves the seat and all its positions. Especially the awning and how well it shields his face from the sun. -The basket is so big and roomy! Also very easy to access. -That there are not extra parts you have to buy to convert it to a double stroller. -Easy fix for more storage for parent, just buy an attachable storage pouch. I think Evenflo even makes one for their strollers. -It stands on its own when folded! -Adjustable footrest for your kid. -One foot, flip flop friendly foot break. -Pretty compact when folded even with one toddle seat still attached. -Lots of seating position options! Overall this stroller definitely has its competition beat. I'm looking forward to being able to purchase the attachable ride along board. Then it will be able to accommodate 3 kids! Amazing. Very very pleased with this stroller. Over all the stroller is good, but the color was ugly. I think he pictures look like a rose color but in reality is an ugly grey. Also it was a gift and they forgot to put my message on the box. I am so happy with the pivot travel system! First of all it is a beautiful color (I get so many compliments). The travel system is all you need from day 1. 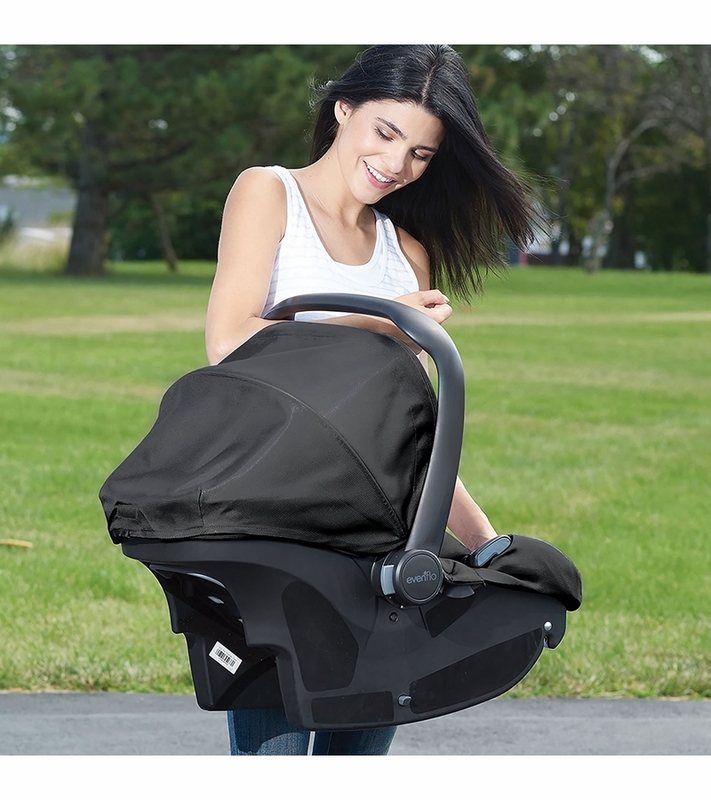 It comes with the carseat base, carseat, stroller, and even cover up for the stroller. The car seat click in the stroller for newborns and later on you can use the original stroller seat (that you can convert in a bassinet). The stroller is easy to use and doesn't take much space. The car seat is roll over tested and is si comfortable for my baby. The travel system goes for a great price since it has all you need since day 1 for your baby. It has been a great purchase for us, we love it! Absolutely love the color and all the feature. Assembly was a breeze, storage at the bottom is very spacious, it's pretty easy to push and it looks very nice and sleek. 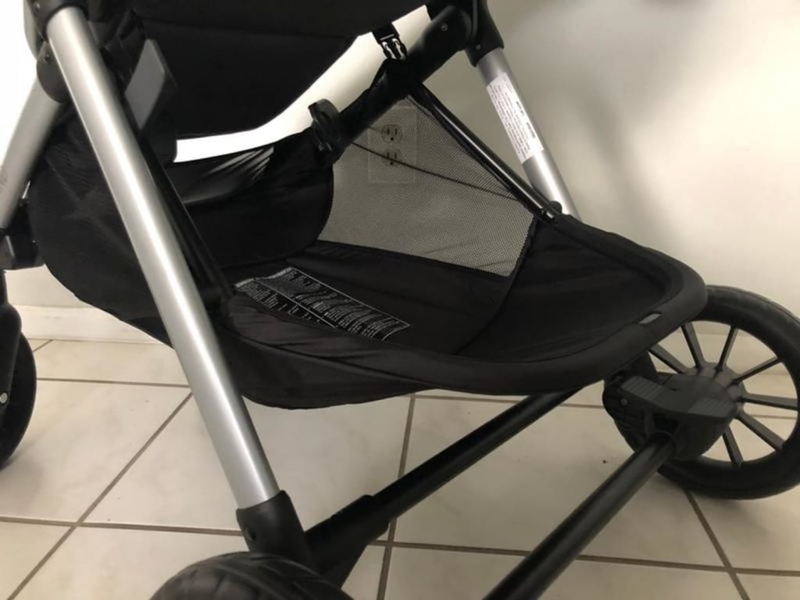 I always look for products that are versatile because I love it when there are features that adjust with our growing baby- which is why I love this stroller! The infant car seat is perfect! We bought another base so that we can easily click it in to either vehicle. It is so nice to be able to move our baby from car to stroller to home- all without disturbing him and waking him up. Plus I love the additional seating options to the stroller, such as the bassinet. A huge plus, as well, is the large storage area underneath which is great for storage and shopping. Being a first time mom, I wasn't sure what I needed and I am so glad a friend recommended this product to me because it has been fantastic!